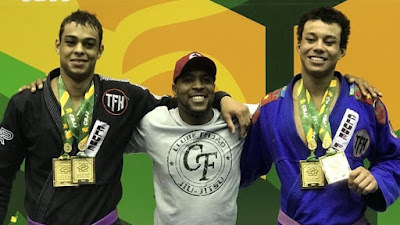 Brothers Anderson and Erich Munis shared the top spots in both of their weight divisions and the open class at the 2018 IBJJF Brazilian Nationals on Thursday in Barueri.The siblings, who are separated in age by two years (Anderson was born in 1995; Erich was born in 1997) competed in the heavyweight and absolute division. There were a total of 28 entrants in the heavyweight division. The Nova Uniao team members hail from Maringa, a city in the southern state of Parana, and train under renowned coach “Feijao” (pictured top). Anderson and Erich both competed at the recent UAEJJF World Pro in Abu Dhabi, with Erich taking gold and Anderson taking bronze.